NICE PEAKS Looking over Marsh Lake into the John Muir Wilderness, the snow level in the Sierra Nevada is much lower than it has been the past few years. It's getting hot already. 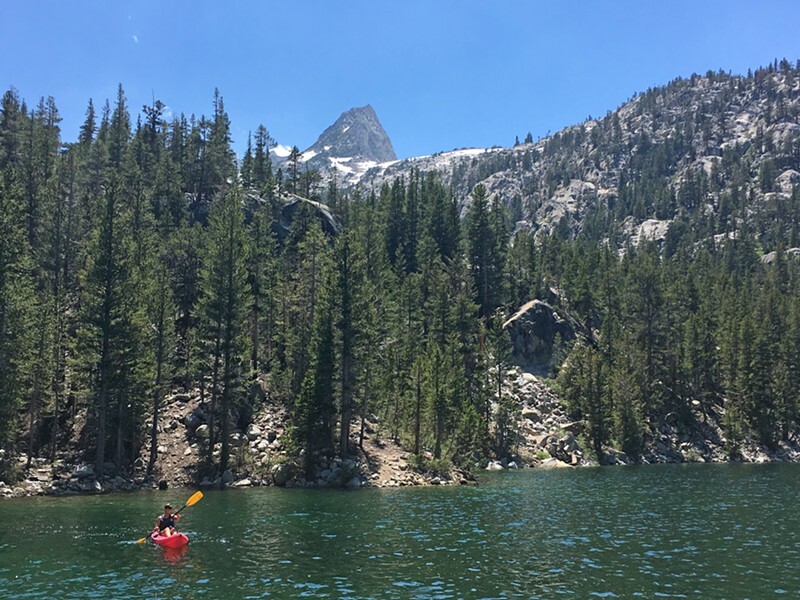 I open the hatchback and stretch my legs all the way out, bare feet hanging out the back of my car in the 75-degree cool of a summer morning on the Eastern flank of the Sierra Nevada. Independence Creek trickles away as purple-pink shades of sunrise tint the barren mountains that shadow the Onion Valley. Putting my arms behind my head, I stare and sigh. I've been waiting for this: My annual trip to the east side, where heat, water, and mountains collide into deep breaths and solitude. DUSTY TRAIL The McGee Creek trail is dry and hot for the first couple of miles, with random brooks and creeks running across it and down to the creek below. The next stop is Tom's Place, about 30 minutes north of Bishop on Highway 395, where I will meet my friends and scarf down the chicken-fried steak, eggs, and crappy coffee that will satiate me before Mosquito Flats does the exact opposite. 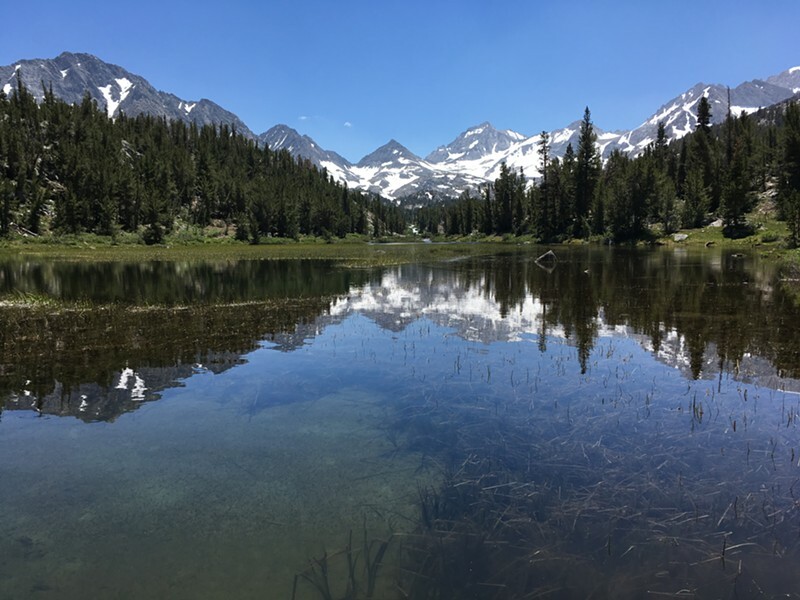 The trail that heads into the John Muir Wilderness from the Rock Creek drainage is awe-inducing from its 10,300-foot start, which is probably why it's one of the most popular trails on the east side—sort of like a human highway, except instead of rest areas, there are jaw-dropping lakes to sit by and snow-topped peaks to stare at. 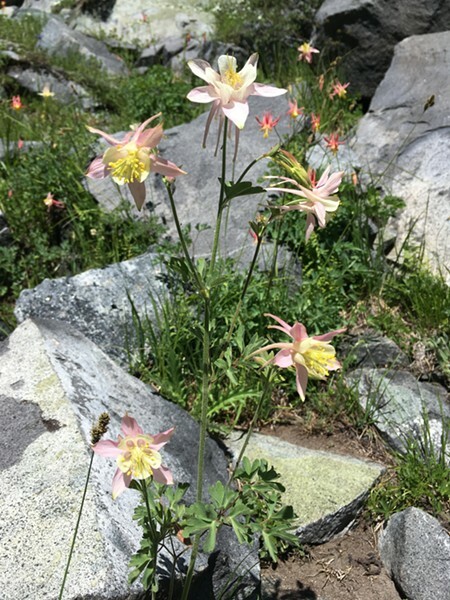 DARLING As the Mosquito Flats trail through Little Lakes Valley heads farther into the wilderness, columbines pop up around the mountain lakes. Water is everywhere. Trickling down rocky steps, crisscrossing and sometimes consuming the trail. About a half-mile in, my friend's 5-year-old child is already soaked. He careens into another puddle, laughing, steadies himself, and then launches into the next one. We skirt around the side of Marsh Lake, about a mile into Little Lakes Valley, to do some fishing. The age range of our little trekking crew spans from 5 to 60-something, so we can't go too far. I'm already planning to come back up here on my last day, for a lengthier climb to a higher lake. We are staying in the drainage to the south. It's en route to South Lake outside of Bishop, which we spend the next day boating and fishing on. But after my friends head back to the coast, I pick up camp with a little bit of faith and head north again, hoping to stay somewhere along Rock Creek Road. SITTIN' PRETTY The fish in South Lake were biting all day long, whether they were being caught from a kayak, a pontoon boat, or from the shore. I decided I needed to find a hike I hadn't done before. 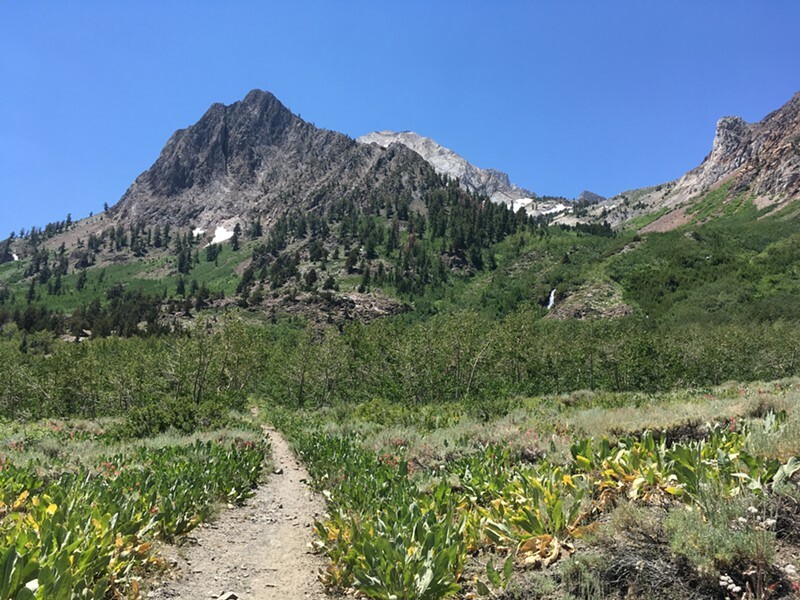 A few miles north of Tom's Place, I turn onto McGee Creek Road and take it until it dead ends at another trail that heads into the John Muir Wilderness. This trail's start is almost the antithesis to Mosquito Flats. There's the creek, which is raging in torrents of white water that whip by so fast my dog doesn't want to go near it. But it's far below the dusty, open, and hot trail. Red/orange Indian paintbrush, sage, mule's ears, and the occasional mariposa lily are the only consistent vegetation, with the random gathering of willows around babbling brooks heading down to McGee Creek. HEADING OUT Taking a detour off the Mosquito Flats trail due to a high water crossing, we trek back from Long Lake to the trail at the end of a much-needed long weekend in the Sierra. About 2 miles in, my pit bull's tongue is almost dragging on the ground, and we finally get to a vantage point where I can just barely make out Horsetail Falls way above us. A smattering of tiny blue butterflies (or maybe moths?) flutter above the water in the shade. I have two choices—take off my shoes and brave the water to continue hiking or head back. For my dog's sake, I'd like to make it back to the car before it gets much hotter. And for my sake, I'd like to find a camping spot before it gets too late. Every site I pull into along Rock Creek Road is full. The last ditch effort is Rock Creek Lake, which it turns out is first come, first serve—always. No reservations allowed! Unbelievably, there is one tent site left. After snagging it, I grab a couple of beers, and my dog and I head to the other side of the lake, away from crowds and cars to soak in the last mountain sunset and swim. 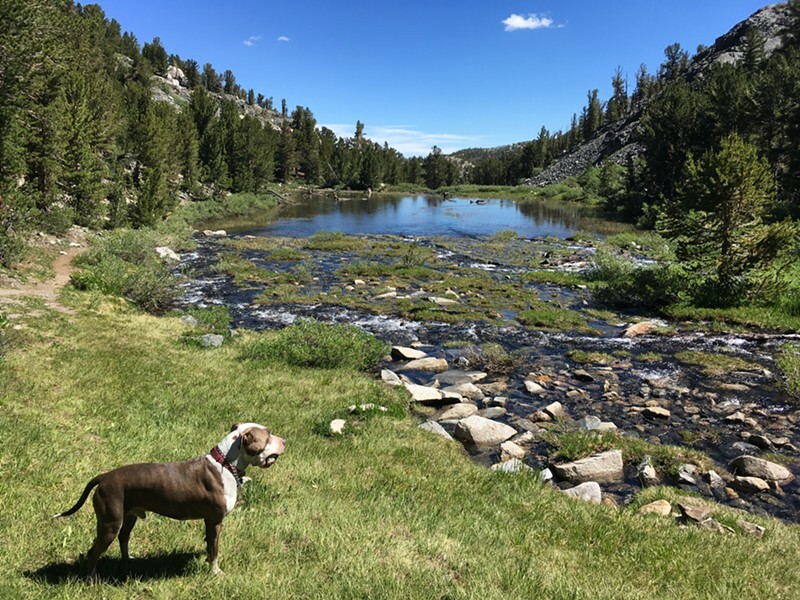 Editor Camillia Lanham dreams about a little lake in the mountains at clanham@newtimesslo.com.